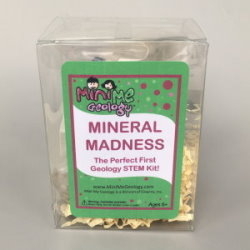 Mineral Madness is STEM science at its best! 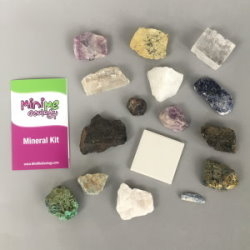 This kit is perfect for kids starting out in geology who love the fun colors and properties of minerals. 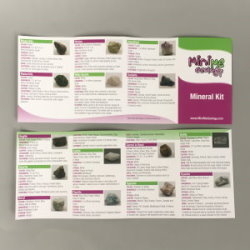 This neat kit comes with 15 mineral samples including augite, azurite, beryl, calcite, fluorite, garnet, gypsum, halite, kyanite, magnetite, malachite, olivine, milky quartz, amethyst, and sodalite. A white streak plate for sample testing and an information brochure help you determine the names of each of your samples. Once you identify your samples using the information and pictures in the brochure, read more about your samples to find out the common uses, scientific properties and the common locations where they are found. We have free resources in the Dig Into Geology section of our website to help you identify your samples. You can download a mineral ID flow chart and watch a video on how to use the diagram, learn how to perform a proper streak test , and determine the hardness of your new samples.